Damp concrete floor to the kitchen area of property in Birmingham and fixing patches of rising damp. Removal of the contaminated plaster, application of damp proof tanking system to walls and re plastering. Removal of damp concrete floor, installing correct damp proof membrane and insulation and re-laying of concrete. The first area of this Birmingham damp proofing project to tackle was the rising damp patches. Our technicians stripped back the contaminated plaster before drilling the mortar at an appropriate level for the injection of the remedial damp proof course. The next step was the install the tanking system to prevent any contamination passing through to the new plaster, base coat plasters were applied to level and then the areas where ready for re-plastering. The concrete floor was broke up and dug out using heavy demolition breakers, the large amount of rubble was then removed in skips. The floor was then ready for our technicians to line the base with a damp proof flooring membrane topped with adequate insulation. Our team then began to fill the floor in with concrete starting with each corner and working out to create the correct depth and level. 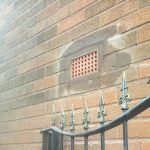 After firstly being hesitant to employ a company to undertake such a large and intrusive job in my home I was soon made to feel at ease by the positive attitudes and friendliness of the team at Damp Proofing Solutions. Very happy with the finished job.